Get in the mood for Halloween at Slotastic Casino with some great bonus offers. Start with a 50% deposit match bonus on your next purchase up to $113 free, plus claim 13 free spins to top it all off. The 13 free spins are played on the Count Spectacular Slot. There is no maximum cash out attached to this bonus. This bonus is valid until October 12th 2015. You can also claim up to 50 free spins on the Count Spectacular Slot each day this October. Deposit between $10 and $19 and you can claim 10 free spins. Deposit between $20 and $49 and get 20 added spins on the Count Spectacular Slot. Deposit $50 or more and get 50 free spins on the Halloween themed Count Spectacular Slot. This bonus can be claimed once each day up until October 31st 2015. Don’t forget that once you make at least one valid deposit at Slotastic Casino this October 2015 you can also claim a free $25 bonus. Don’t miss out on any of these bonuses for October 2015. 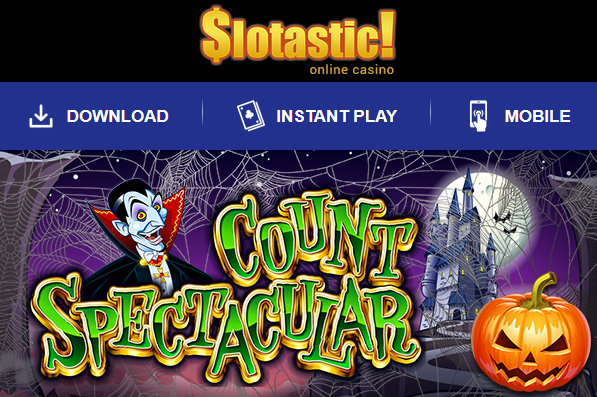 Claim your Slotastic Casino Halloween 2015 bonuses now before it’s too late! This entry was posted on 7 October,2015 at 2:08 pm	and is filed under Account Holders, Deposit Bonuses, Free Bonus, Free Spins, New Accounts, RTG. You can follow any responses to this entry through the RSS 2.0 feed. You can leave a response, or trackback from your own site.